Much calmer day at Stick. Just three people out Bert, Robert and I. 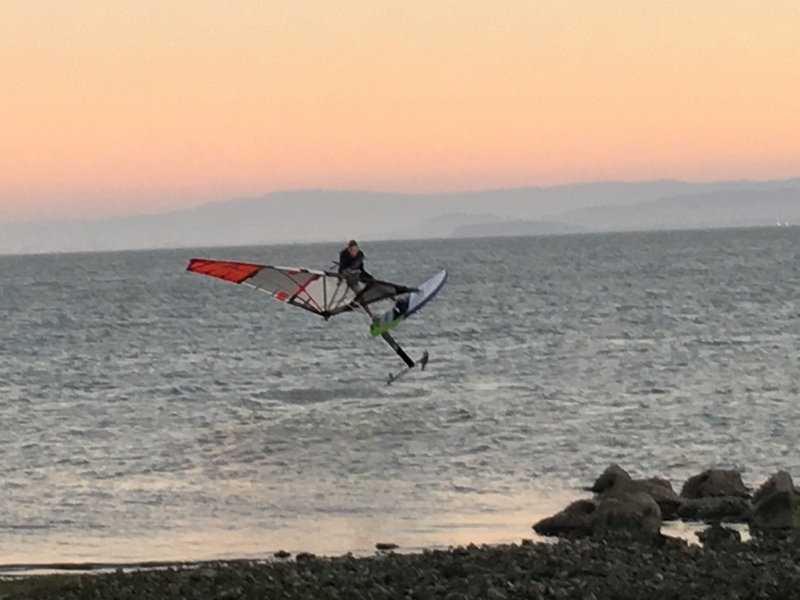 Two windfoils and one windsurf. Wind is very weak but eventually comes up at around 3:45 to allow a steady navigation with 7.3 Switchblade and Isonic. Fun in a warm beautiful October afternoon. Bert out with a JP 135 and a humongous front foil (Naish?). It is interesting to watch from the beach. The boards gets up on the foil in seemingly no wind and seems to hoover on the water, moving forward at a very slow pace! Kind of a magic trick. Robert out with the all new JP 135 foil + 2019 F4 race foil (1 meter mast!). For his weight range (200 pounds) foil is a godsend. Here he goes with a 6.2 wave sail where in the past he would have struggled with a 7.8. Speed for now seems to be around where it was with his previous NP Alu: just powered I slowly gain on him with the Isonic. In my weight range (I am 160) foil would give less of a dramatic advantage but ... still .... I would have been out with a 5.8 with no problem ... 3 sails, 4.3-5.0-5.8 covering the complete range February to October? Sunday, constant threat of a windshift to North, WSW maybe 7-16 max, with some gusts to 12 only, one 150 lbs. foiler barely up but able to plane on 6.5, that 111 Isonic comes thru with a 7.4 no cam almost hitting top speed at moments for a couple of runs before fear of windswitich brings me in. Turns out, WSW lasts from 2:45 to 4:30 before slowly dropping off. Not heading towards foiling until wind drops below 13 in the gusts. Brief 45 minute sesh at Berkeley moderate powered 6.2 and 110. 2 runs past Pt. Emery and 10 halfway. Second day in a row for the Stick. Miss yesterday but Today I am there in perfect 5.8 conditions. First out very powered up with RRD FSW 90 around 3 pm, but soon switch to the Exocet Warp 62 (2008!) when the wind drops a notch. That takes me through a fabulous afternoon of steady (by Stick standards) wind. Lots of people out, I leave at 6:15 and it still is blowing, with the sun disappearing behind the hills. Sailing my 5.0/100 combination on an easy mellow Friday afternoon at the stick till sunset. 7 guys out, including two guys, Robert and Grahame, on foil boards. Grahame is one of the regular freestylers here but today is the first time I saw him on a foil. His home base is Reo Vista. He was having a good time doing foil jibes, foil duck jibe, loops and all kind of freestyle moves. So I asked him how long he has been foiling. He replied "just a couple months". Wow! Looping on a foil board in a couple of months? Then Jason Voss chimed in and said "foil looping is easy, you just need balls"
If It Were Easy, They'd Call It Foiling?? Wow ... Ok foiling IS the future! I might be wrong but...didn't Wyatt front and backlooped the Slingshot foil after 2 months of foiling? He was also on a Slingshot. Check out this drone video taken three days ago on another mellow day. Nice day at Berkeley Sat. Started just powered 6.9 and 111 Isonic, gusts to 16, slow rise to gusts of 23, then slow fade for a 1.5 hour session.